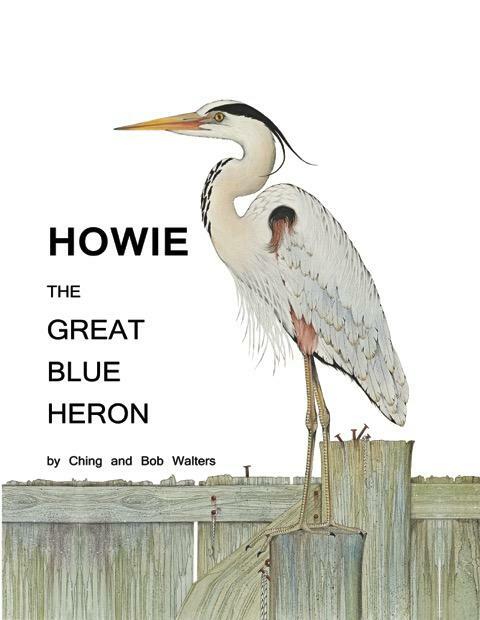 Ching and Bob Walters - "The Tale Of Pelican Bob" and "Howie The Great Blue Heron"
Mary Walters, born in Memphis Tennessee and raised on a farm, is an accomplished artist and illustrator. Known professionally by her childhood nickname "Ching", she received her first professional commission when she was 12 years old. Ching is known for her large detailed watercolor paintings and acrylics on canvas. Over the years she has been involved in numerous art categories other than fine art including more than two thousand postage stamp designs for more than 30 foreign countries, countless rubber stamps, food container designs, and illustrations for many hundreds of greeting cards. Ching has also illustrated 14 children’s books. Ching conceived the story, wrote the text, and drew the illustrations for The Tale of Pelican Bob. Her husband Bob is an ex-Navy Fighter Pilot decorated for heroism. He flew 153 combat missions in North Viet Nam operating from the aircraft carrier USS Oriskany. He retired from Trans World Airlines as an International Captain. Bob collaborated with Ching on the text, he photographed and digitized Ching’s images, and he prepared the layout of this book. Ching and Bob have lived in numerous places during their 46-year marriage. Most recently they were permanent residents of Italy for many years, but they always return to the Gulf Coast area. Currently they live just outside the small town of Loxley, Alabama with their two Labrador Retrievers. Ching sells her paintings in a number of galleries in Mississippi, Alabama, and Florida.